MainAll NewsUS & CanadaWho is pushing Jews out of academia in the US? Expert on struggle against BDS says steps taken by Trump administration against anti-Israel groups on campuses are the critical response. Dr. Sharona Aharoni-Goldenberg, an expert on the struggle against BDS, says that the Trump administration's decision, according to which anti-Israel activity on college campuses will be defined as anti-Semitism, is a turning point in the fight against anti-Semitic activity on campuses. "This is a very important decision. 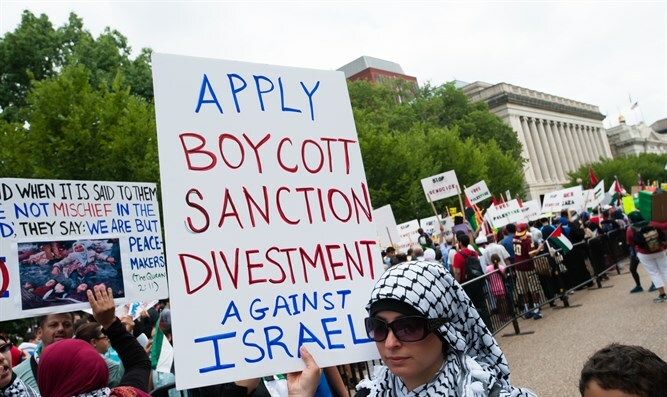 The BDS movement today, which really appears to be activated by an invisible hand - and the feeling is that it is funded by totalitarian elements - works to remove Jews from academia. There is real activity against Israeli lecturers, regardless of their position or opinion, but rather because they are Israelis," Aharoni-Goldenberg said in an interview with Israel Hayom. "The activity is not just against Israeli lecturers. If you are a Jewish professor who uploads a post for Israel, you will be fired," she says. "It's not a parable, US lecturers who worked against ‘Apartheid Week’ were fired from the institutions at which they taught. The same applies to many Jewish students who simply feel uncomfortable on campus." She adds that a recent study revealed a close connection between the activities of lecturers who support boycotts against Israel in a certain institution and a sharp rise in anti-Semitism in the same institution. "There is a phenomenon of pushing the Jews out of academia in the United States, Britain and Europe. We have no clear data, but from background conversations with activists in the Jewish communities, there is a feeling that there is an invisible hand that works to keep Israeli lecturers, Jewish lecturers and Jewish students out of academia. Once the academy begins to be selective on the basis of race, religion and nationality, it means that the situation is very tough. The academy represents the future intelligence of the future leaders, and if there is an infiltration of anti-Semitism then we must wake up," says Dr. Aharoni-Goldenberg. "This anti-Semitism is against Israelis and against Jews, regardless of their position on the Israeli-Palestinian conflict. The boycott is also against people on the left," she said. "The BDS position is that we have to bring 5 million Palestinians back into the Green Line and destroy Israel." "There is discrimination here, which appears to be managed from afar, and there is a feeling that thugs are being sent out from totalitarian states and that they are being funded. They are talk about human rights, as it were, but these are catchwords, and when you dig a little deeper, you see that there is a violation of the human rights of Jews and Israelis everywhere. This is on the way to achieving their goal, which is to destroy Israel," she concluded.